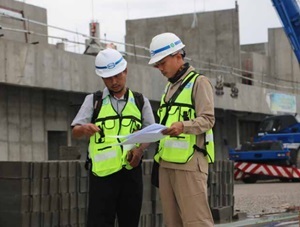 PT Wijaya Karya (Persero) Tbk - WIKA is a leading and reputable state-owned company in Indonesia that is involved in general construction industry. Together with its 7 directly-owned subsidiaries, WIKA has main business focus rests on 5 business pillars: Industry, Infrastructure and Building, Energy and Industrial Plant, Realty and Property, and Investments. WIKA's subsidiaries comprise of PT Wijaya Karya Rekayasa Konstruksi (90.04% owned by WIKA), PT Wijaya Karya Gedung (69.30%), PT Wijaya Karya Bitumen (99.00%), PT Wijaya Karya Serang Panimbang (80.00%), PT Wijaya Karya Beton (60.00%), PT Wijaya Karya Realty (90.88%), and PT Wijaya Karya Industri dan Konstruksi (97.22 %). JobsCDC.com now available on android device. Download now on Google Play here. Please be aware of recruitment fraud. The entire stage of this selection process is free of charge. PT Wijaya Karya (Persero) Tbk - Harbour Road 2 Project WIKA November 2018 will never ask for fees or upfront payments for any purposes during the recruitment process such as transportation and accommodation.